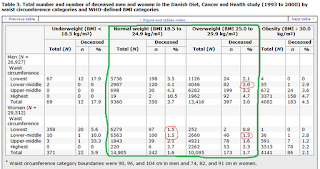 Health Correlator: The lowest-mortality BMI: What is its relationship with fat-free mass? Very good analysis - I knew there had to be something behind the "obesity=longevity" meme. 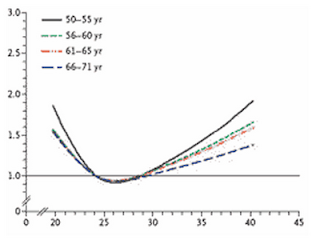 I've seen one study that broke down the BMI-mortality curves by disease types. Low BMIs tended to die from lung diseases. And low BMIs were also associated with smokers. 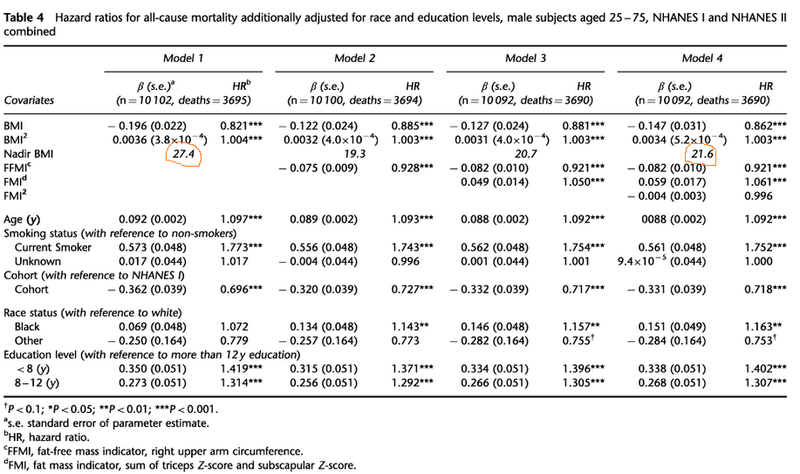 I was left with the impression that the lowest all-cause mortality risk was biased towards higher BMIs because of smokers. Could this be the case? BMI at death would seem flawed anyway since sick people often lose lots of weight before they die - like cachexia in cancer. If the BMI is figured out somehow for the way people live their lives prior to being sick, that would be more meaningful IMHO. Do these types of studies take that into account? Hi Marty. Both studies linked in the post control for smoking as a possible confounder. Hi Suzie. Those numbers are certainly not measured at the time of death. Usually those measures are collected years before death, and then the participants are followed for a period of time or until death – what is called a “prospective cohort study”. Fascinating study. This is very important and resolves the paradox I've struggled with that we evolved to be relatively lean, yet overweight seems to be the lowest-mortality category today. Hi Stephan, thanks. I still there is more to this story, perhaps something to do with the combination of fat-free mass and body weight, and how it regulates nutrient intake via calorie intake. It is interesting that the lowest mortality seems to occur at the point where an optimal balance between fat-free mass and weight is achieved, which may involve carrying some, mostly subcutaneous, body fat. When we look at hunter-gatherer populations in general, however, my impression is that the “natural” BMI is lower. For example, the men tend to all look like lightweight boxers. i think i remember professor de vany posting a while ago that the overweight people lived longer cuz they had more muscle than thinner people. but i believe he was talking about the elderly. professor de vany emphasizes the importance of muscle mass in insulin regulation and the immune system. BMI is misleading. Higher BMIs can result from muscular people also, who most definitely will have a healthier life. Bodybuilders often have a "high" BMI, but it's not because they are fat, it's because the BMI measurement itself is flawed and does not tell the whole story. Hi v/vmary. Yes, I think I remember him saying that. Hi Dan. Bodybuilders are not very common in comprehensive samples of individuals. They are usually males, and they are rare. I am talking about bodybuilders that are committed enough to achieve results in terms of muscle gain that will significantly influence BMI. 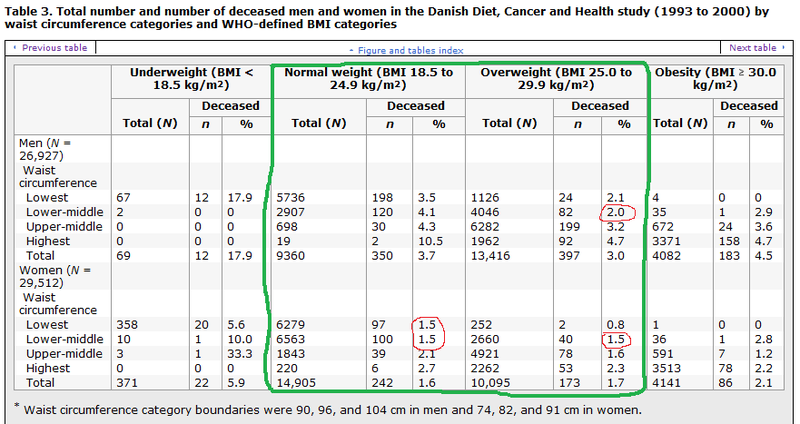 If you take a look at the second table, from the paper by Bigaard and colleagues, the category with the least mortality was the “overweight plus lower-middle waist” category. It had over 4,000 individuals in it – about 30 percent of all overweight individuals. My guess is that only a few, very few, of the individuals in that category were bodybuilders. There doesn't seem to me to be any good reason for distinguishing between lowest and low-middle waist circumferences in the males. We're talking 2% versus 2.1%. In this kind of study, I would call those virtually identical, right? Hi David. I’ve done some estimates on this before, and would have to look at them to be sure, but I think that one single extra inch in waist circumference translates into a nontrivial increase in body fat percentage. "this does not mean that you should try to bring your BMI to 21.6 if you want to reduce your risk of dying "
Since it's a correlative study, it's not likely that it teaches anything conclusive about what you should do. Hi dearieme. I am not sure exactly what you mean. Virtually all quantitative studies either support or not hypotheses based on coefficients of association (of which the correlation is one type). No single study “proves” anything. More generally, no empirical study can prove a hypothesis. Empirical studies are designed to disprove hypotheses. Apparently the way I wrote the question may you misinterpret my emphasis. I wasn't suggesting that there is little difference in the body composition between the two waist size groups. What I was noting is that, as far as I can see, there is little difference in mortality rates of 2.0% and 2.1%. Certainly not enough difference (if there in fact is a statistically significant difference) to encourage me to try to increase my waist size in pursuit of health. So I think that both of those numbers should have been circled in red. I'm always a little troubled by studies that bin results into ranges where the bottom and top ranges are "< x1" and "> xn". Such an approach may include subjects who are way out on the distribution curve. So when I read that we are comparing the mortality of people with waist circumferences of 0-90 cm with those who have WCs of 90-96 cm, I really wonder how many of the people in the 0-90 cm group are at, say, 65 cm? Hi David. You are right in that some of the differences are too small to be relevant; the main accomplishment of the study, in my opinion, is to point at a different direction for the interpretation of the “overweight-longevity paradox”. It seems that retention of fat-free mass is the key. As for your doubt: “I really wonder how many of the people in the 0-90 cm group are at, say, 65 cm”. That is easy to answer: none. Barring coding/measurement error, all of the people in each cell fit the criteria for inclusion in the cell. Sorry David, I saw what you wrote, but somehow had in my mind the lowest mortality cell for men, in the lower-middle waist range. Yes, it is possible there were men with 65-cm waists in the other cell – although a bit unlikely, as that would be around 25-26 in. More likely for women; especially women like Megan Fox! As one would expect, the distribution of both BMI and WC is a skewed curve--since it is possible to go way up in both, but not possible to go down too far without disappearing. Eyeballing it, it looks as if minimum BMI and WC (about 16 and 55cm respectively, and maximum BMI and WC (somewhere around 65 and 160 cm) are very much the same for men and women. I wish the researchers in the study you cited had clipped off the long tails. I suspect the health outcomes for the > 104 cm WC might have been very different than, say, a group of 104-110 cm WC. Ditto < 90 cm versus, say, 82-90 cm. Someone with a BMI of 25.5 and a WC of 82 cm (about 32 inches) probably looks pretty good--trim and muscular. 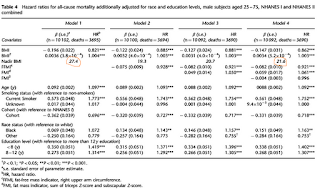 In other words, it wouldn't surprise me if the "sweet spot" on their mortality curve for males with BMI of 25-29.9 is really somewhere in the WC of 30-34 inches rather than the 35-38 inches. You're correct about the take-home point, though--the overall effect we're seeing here is probably related to having a good dose of lean body mass and a low level of visceral fat--with or without a little subcutaneous fat. I am very happy to see the update here.